Parliamentarians Prasanna Ranatunga and Dilum Amunugama have been removed from their posts of SLFP chief organiser of Minuwangoda and Senkadagala electorates respectively in a major shake up of SLFP organiser posts in keeping with the powers vested in President Maithripala Sirisena in his capacity as the SLFP chairman. 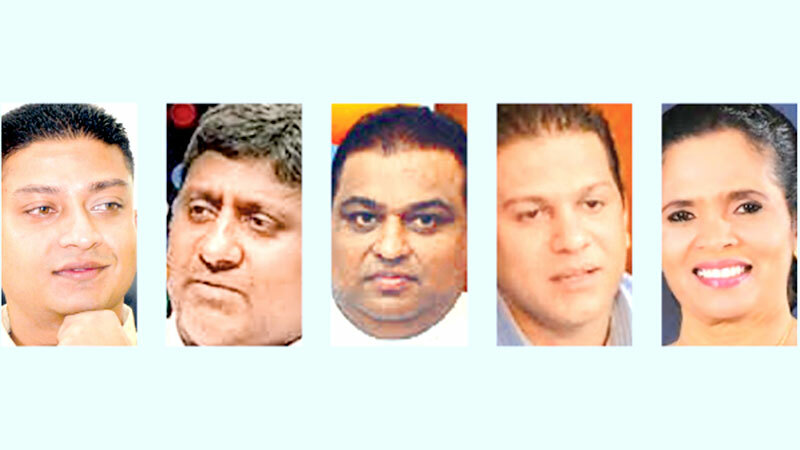 In their place, Prasanna Ranatunga’s brother Ruwan Ranatunga has been appointed as SLFP chief organiser for Minuwangoda and Central Provincial member Thilina Bandara Tennakoon has been appointed as SLFP chief organiser for Senkadagala. Following a major shake up of SLFP organiser posts, former Maharagama Mayor Kanthi Kodikara has been removed from the post of SLFP chief organiser for Maharagama and Western Province Chief Minister Isura Devapriya has been appointed as SLFP chief organiser for Maharagama. With Thilina Bandara Tennakoon who was the SLFP chief organiser for Kandy moving on to Senkadagala, Mahinda Abeykoon has been appointed to fill the vacancy of SLFP chief organiser for Kandy. Minister S.B. Dissanayke who was SLFP chief organiser for Udunuwara has been shifted to Hewaheta as SLFP chief organiser and Central Provincial Council member Manel Bandara has been appointed to Udunuwara as SLFP chief organiser. Meanwhile, Mohamed Zimsan has been appointed as SLFP chief organiser for Akurana to fill the vacancy created by the death of A.R.M.Abdul Cader. Chandima Rasaputa has been appointed SLFP chief organiser for Matara in place of Sanath Jayasuriya and Sanjaya Siriwardena has been appointed as co-organiser for Mirigama. Late Minister M.K.D.S. Gunawardena’s son Nalin Gunawardena has been appointed as SLFP chief organiser for Seruwila. Minister Mahinda Samarasinghe has been shifted from Agalawatte to Panadura as SLFP chief organiser to fill the vacancy created with the appointment of former organiser Reginald Cooray as Northern Province Governor. Ranjith Somawansa is the new SLFP chief organiser for Agalawatte. Keerthi Udawatte has been appointed SLFP chief organiser for Dehiwala - Mount Lavinia in place of Dhanasiri Amaratunga. Hector Bethmage is the new SLFP chief organiser for Colombo West and Sumith Vijithamuni Soysa SLFP chief organiser for Avissawella. Sumithlal Mendis is the new SLFP co-organiser for Kalutara. Prasanna Solangarachchi has been appointed as SLFP organiser for Kolonnawa in place of Duminda Silva. Meanwhile, Sujeewa Chandrasiri is Colombo district SLFP organiser, Anju Sri Sharma Perera district organiser for Gampaha, Asanka Ediriweera SLFP district organiser for Kalutara, Channa Saliya Mendis and Thisara Gunasinghe co-district organiser for Galle and Pasanda Yapa Abeywardena and Nalin Ranaweera co-district organiser for Matara.